The Wells clinical prediction guide quantifies the pretest probability of deep venous thrombosis (DVT) (see Table 1 below). The model enables physicians to reliably stratify patients into high-, moderate-, or low-risk categories. Combining the pretest probability with the results of objective testing greatly simplifies the clinical workup of patients with suspected DVT. The Wells clinical prediction guide incorporates risk factors, clinical signs, and the presence or absence of alternative diagnoses. See Deep Venous Thrombosis for more information. Pretest probability score calculated from the Wells DVT score can be stratified in either 2 or 3 risk groups. In the 3 risk group, patients with a score of 0 or less are considered low risk, 1-2 are moderate risk, and 3 or greater are high risk. In the 2 risk group, patients are stratified as DVT unlikely (Wells score < 2) or DVT likely (Wells score =2). See Table 2 below. This risk group stratification is then considered in concert with the results of a highly sensitive D-dimer assay such an enzyme-linked immunoabsorbent assay (ELISA) or quantitative latex/immunoturbidimetric-based testing. Using the 2 risk group stratification, if the pretest probability scores as unlikely to have DVT, a negative D-dimer rules out DVT. A positive D-dimer requires a diagnostic study (eg, duplex ultrasonography). If the patient has a negative diagnostic study, DVT is ruled out. If the patient has a positive diagnostic study, the patient should be treated for DVT. If the pretest probability scores as likely to have a DVT, the patient should have a D-dimer and diagnostic study performed. If the diagnostic study is positive, the patient should be treated for DVT. If the diagnostic study is negative as well as the D-dimer, DVT is ruled out. If the diagnostic study is negative, but the D-dimer is positive, most authors would recommend a repeat diagnostic study in 1 week. If the study is positive, the patient should be treated for DVT; if the study is negative, DVT is ruled out. 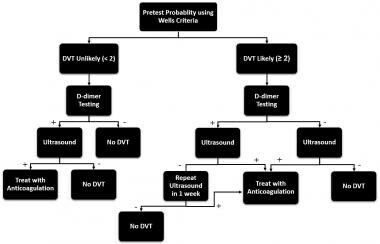 Algorithm for deep venous thrombosis (DVT) evaluation using 2 risk stratification Wells criteria. Adapted from Scarvelis et al. The American College of Physicians (ACP) has created guidelines based on the 3 risk group stratification for first-time DVT. If the pretest probability is low (Wells score =0), a negative D-dimer or diagnostic study (eg, compression ultrasound or whole-leg ultrasound) rules out DVT. If the D-dimer is positive, diagnostic imaging is indicated. If diagnostic imaging is negative, DVT is ruled out. If imaging is positive, then the patient should be treated for DVT. ACP guidelines recommend using D-dimer over diagnostic testing. If diagnostic testing is used, imaging of the proximal leg veins with compression ultrasound is preferred over whole-leg ultrasound. See the low-risk algorithm below. 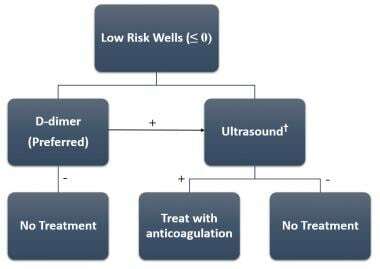 Algorithm for deep venous thrombosis (DVT) evaluation using the 3 risk stratification Wells criteria: low risk. For moderate pretest probability (Wells score 1-2), a D-dimer is recommended. If the D-dimer is negative, the patient has been ruled out for DVT. If the D-dimer is positive, either compression ultrasound of the proximal leg veins or whole-leg ultrasound is indicated. If compression ultrasound of the proximal vein is used and DVT is found, the patient should be treated for DVT. If no DVT is found, the patient should have a repeat ultrasound in 1 week. If whole-leg ultrasound is used and no DVT is found, DVT is ruled out. If a proximal clot is found, the patient should be treated for DVT. If a DVT is found only in the calf vein, treatment should be individualized and have either repeat testing with ultrasound in 1 week to evaluate for possible DVT propagation or treatment for DVT if the patient is unable/unwilling to have a repeat ultrasound. If no treatment is initiated and a repeat ultrasound is done, treatment is only recommended if the DVT has propagated proximally. See the moderate-risk algorithm below. 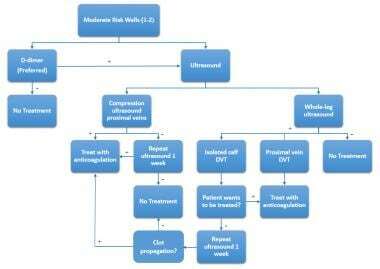 Algorithm for deep venous thrombosis (DVT) evaluation using the 3 risk stratification Wells criteria: moderate risk. For high pretest probability (Wells score >2), imaging is recommended as first-line testing. If imaging is positive for DVT, the patient should be treated for DVT. If whole-leg imaging is negative, the patient has been ruled out for DVT. If compression ultrasound of the proximal veins is negative, a D-dimer can be performed. If negative, the patient has a DVT ruled out; if not, repeat imaging is indicated in 1 week or venography can be performed the same day to rule out DVT. See the high-risk algorithm below. 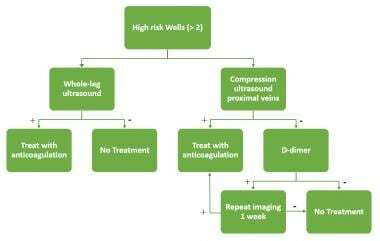 Algorithm for deep venous thrombosis (DVT) evaluation using the 3 risk stratification Wells criteria: high risk. Anand SS, Wells PS, Hunt D, Brill-Edwards P, Cook D, Ginsberg JS. Does this patient have deep vein thrombosis?. JAMA. 1998 Apr 8. 279(14):1094-9. [Medline]. Hargett CW, Tapson VF. Clinical probability and D-dimer testing: how should we use them in clinical practice?. Semin Respir Crit Care Med. 2008 Feb. 29(1):15-24. [Medline]. [Guideline] Bates SM, Jaeschke R, Stevens SM, et al. Diagnosis of DVT: Antithrombotic Therapy and Prevention of Thrombosis, 9th ed: American College of Chest Physicians Evidence-Based Clinical Practice Guidelines. Chest. 2012 Feb. 141(2 Suppl):e351S-418S. [Medline]. [Full Text]. Scarvelis D, Wells PS. Diagnosis and treatment of deep-vein thrombosis. CMAJ. 2006 Oct 24. 175(9):1087-92. [Medline]. [Full Text]. Hegsted D, Gritsiouk Y, Schlesinger P, Gardiner S, Gubler KD. Utility of the risk assessment profile for risk stratification of venous thrombotic events for trauma patients. Am J Surg. 2013 May. 205(5):517-20; discussion 520. [Medline]. Imberti D, Benedetti R, Ageno W. Prevention of venous thromboembolism in acutely ill medical patients after the results of recent trials with the new oral anticoagulants. Intern Emerg Med. 2013 Dec. 8(8):667-72. [Medline]. Nitta D, Mitani H, Ishimura R, Moriya M, Fujimoto Y, Ishiwata S. Deep vein thrombosis risk stratification. Int Heart J. 2013. 54(3):166-70. [Medline]. Coutinho JM, Zuurbier SM, Gaartman AE, et al. Association between anemia and cerebral venous thrombosis: Case-control study. Stroke. 2015 Oct. 46(10):2735-40. [Medline]. Becattini C, Cohen AT, Agnelli G, et al. Risk stratification of patients with acute symptomatic pulmonary embolism based on presence or absence of lower extremity DVT: systematic review and meta-analysis. Chest. 2016 Jan. 149(1):192-200. [Medline].